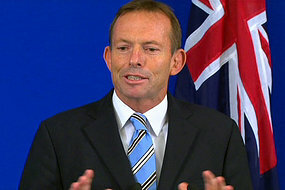 Tony Abbott has confirmed that a Coalition government will not set a price on carbon [dioxide]. TONY Abbott has vowed any government he leads would never introduce a carbon price. The Opposition Leader has hardened the Coalition position, preparing a campaign strategy to target Labor on the basis that it would drive up electricity prices. He said that, even if the international community agreed on a carbon price, a government led by him would not necessarily back it. “I do not support the government going out there and making consumers pay a price on carbon,”Mr Abbott said. Even if there was an international consensus position on a carbon price, a Coalition government would not necessarily fall into line, he said. “Let’s cross that bridge . . . look, it’s not going to happen in the foreseeable future,” Mr Abbott said. “One thing is for sure, if this government is re-elected there will be a carbon price. Climate Change Minister Penny Wong said without putting a price and a limit on pollution, Mr Abbott had no way to meet the emissions reductions targets that he had signed up to. “He should be upfront with the Australian people and admit that his policy is a con that will not do anything to reduce emissions,” Senator Wong said yesterday. But unfortunately, that’s the Labor policy too, and Julia Gillard believes in man-made climate change. Abbott’s comments make me rather suspect he can see the tide is turning regarding CAGW. Now with the DoE suspending CRU funding, his smile must be growing wider than Antarctic sea ice. Don’t be too sure that Gillard is a believer. I had a long conversation with someone who has political contacts and he said that there is more than one climate sceptic on Labor’s front bench and that Gillard is one of them. Thinking back, it would explain a few things.